With so much to see and do in the expansive 760,000-acre park, taking a day trip of Yosemite is possible, but not highly recommended. However, that doesn't mean you shouldn't give it a try. There are ways to explore the legendary travel spot in a single day, though most require research, careful planning, and a can-do spirit. Bridalveil Fall: The paved trail spans .5 miles round-trip and takes about 20 minutes to complete. You start in the parking area and climb to the base of the falls which flows year-round. Expect an easy hike in spring and early summer; however, you may encounter icy conditions in winter. Lower Yosemite Fall: This one-mile trail is wheelchair and stroller accessible and takes about 30 minutes to complete round-trip. The falls trickle from July through August, but gush during early spring. 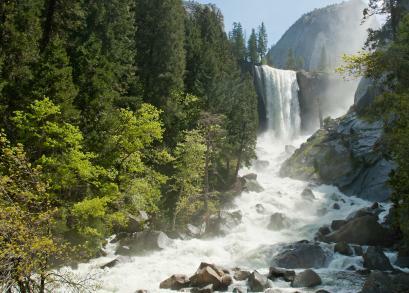 Upper Yosemite Fall: Hiking to this amazing waterfall is only recommended if you are in good health. The 7.2-mile hike is strenuous and can take up to six hours to complete depending on how fast you climb. However, the pay-off for your work is unbeatable, as the trail leads to the top of North America's tallest waterfall. Vernal Fall: This trail to this falls is closed during winter, though in the spring and summer you can find excellent views of Vernal Fall from the footbridge located about a mile from the start of the trail. Beyond the bridge there is a steep granite stairway consisting of more than 600 steps which will lead you to an area that offers unprecedented views of the waterfall. Two-hour ride to Mirror Lake: Ideal for seniors or those looking for a gentle ride with unique photo opportunities. Two-hour Tuolumne Meadows trail ride: Offers excellent views of Yosemite's high country, including Cathedral Range, Johnson Peak and Mammoth Peaks. Keep in mind that all mule riders must be seven years old and at least 44 inches tall. In addition, guests over 225 pounds cannot be accommodated on the mules. Take your day trip to Yosemite to new heights by partaking in a rock climbing adventure you'll remember forever. Yosemite Mountaineering School and Guide Service has been a staple at the park since 1969. Knowledgeable guides offer rock climbing lessons and supervised climbs that allow you to view Yosemite's most stunning features from unique vantage points. 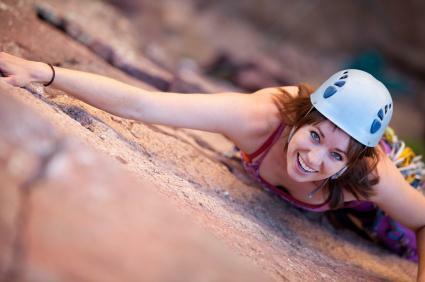 Choose from beginner or advanced climbs that can last from two to seven hours. Climbing gear is available for rent or you can bring your own for all-day ascents. Private lessons are also available. If your visit to California is severely limited, then consider signing up for a day trip tour which includes transportation to and from the park. Several companies, including Extranomical Tours, will pick you up from select hotels in downtown San Francisco and take you to Yosemite by van. 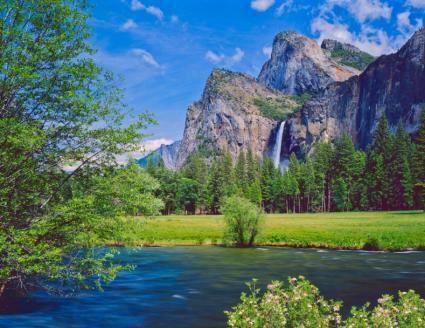 A typical day trip includes a fully guided tour of Yosemite National Park with commentary, photo ops of Half-Dome, El Capitan, and Yosemite Falls, plus a hike to a Giant Sequoias grove. Ahwahnee Dining Room: Fine dining is offered year-round at the historic hotel. Yosemite Lodge: Casual dining is featured all-day and includes hot and cold entrees, sandwiches, bakery and dessert items. Curry Village Pavilion: Serves all-you-can-eat buffet service for breakfast and dinner daily from late March to November. Glacier Point Snack Stand: The informal eatery is only open during the summer and fall. It features hot dogs, sandwiches, beverages, and other small snacks. If you are planning to tour Yosemite during the summer months prepare for a lot of company. Large crowds descend on the natural wonder from late May through early September. Those looking for more peaceful day trips should plan to visit during the month of October and from March through late April. Finally, keep in mind that many of the recreational adventures are only offered from April through October, so plan your trip accordingly.